Coming from humble backgrounds, most of the boys knew nothing of rowing, yet within just a few years of stepping into the boat, they found the greatest victory. I loved reading about the journey that brought them to this place. Although Brown brings a cast of characters into the story, he goes deeper into one boy's life and experiences. Joe Rantz suffered much loss and hardship in his early life, but he persevered and made it into the University of Washington and onto the crew team. 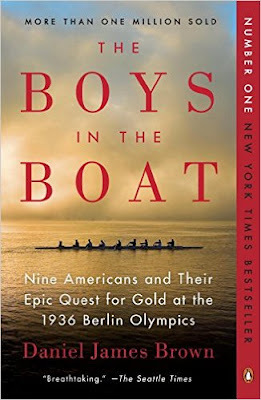 It is Rantz who inspires Brown to write this book, and his personal story brings a depth of emotion and feeling to The Boys in the Boat. We also get a clear picture of the moment in history in which these boys lived. The jobs many of them had to take on in a harsh economy so they could continue to attend school, and the worries that there wouldn't even be jobs available upon graduation, showed how much more they were dealing with every day. At times throughout the book, we also get to see what was happening in Germany at the time, the preparations for the Olympics and the propaganda that was used to give the world a positive image of the country that was already preparing for war. I found the whole book fascinating and it was well-liked by everyone in my book club. We all laughed about the fact that even though we knew the outcome of the Olympic race, we were all on the edge of our seats wondering if they would really do it. That's the sign of some great writing. If you're looking for an amazing account of a great moment in history, I highly recommend The Boys in the Boat. It makes for an excellent book club choice as well. This review was written based on a copy of The Boys in the Boat that I borrowed from my mom. This post includes Amazon Affiliate links. If you purchase something using my link, I will receive a very small commission but your price does not change. I really enjoyed this book too and thought of it last week after I saw the movie Race about Jesse Owens who was at the same Olympics. ha ha - that's exactly what my book group said, too - the subtitle gives away the ending, yet it's filled with suspense! Excellent book - glad you enjoyed it, too. Can't wait to hear the author speak next week!